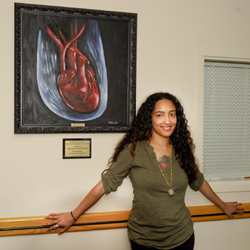 Because of the care her father, Jerry, received in the surgical intensive care unit (SICU) at Rush in August and September of 2009, Marcia Markovic used her creative talent to show how much she appreciated staff efforts by creating an oil painting of a heart. She recently presented it to the staff as thanks for the care her father received and in memory of her father. He was cared for at Rush in the fall of 2009. As a skilled artist, Marcia creates sketches on a variety of topics. Her parents, both artists, helped to guide her interest in painting and sketching. Robert March, MD, associate professor, Department of Cardiovascular Surgery, accepted the gift, which is now hanging in the SICU waiting room on the fifth floor of the Atrium building at Rush. “We are grateful to receive such a thoughtful gift. It’s a true testament to our work and how we care for our patients,” March says. Special thanks to all the physicians from cardiology and cardiac surgery along with the specialized nursing and support staff from the SICU, a recent recipient of the Beacon Award for Critical Care Excellence. The recognition represents the units’ commitment to providing high-quality critical care standards and dedication to the exceptional care of patients and their families. Both the SICU and the neuroscience intensive care unit (NSICU) were honored with the Beacon Award for Critical Care Excellence from the American Association of Critical-Care Nurses (AACN). The Rush NSICU and SICU join an elite group of only 242 intensive care units out of an estimated 6000 such units in the United States that have been recognized for excellence with the Beacon Award. This entry was posted in Heart, Patient Stories and tagged sicu surgical intensive care unit cardiovascular surgery atrium building. Bookmark the permalink.